We’re doubly HOME! Home from a holiday and settled into our new home! We have had a real roller-coaster (literally and figuratively) of a month, starting just before we moved out of our rental home on 29th Apr with the last minute packing and boxing up off all our earthly belongings. 🙂 Then we moved about 140 boxes/bags (we lost count after unpacking 110 of them) into a work-in-progress of an apartment. There were no wardrobes and no kitchen! But our double-volume bookshelves were up (yippee!) so at least the boxes of books could be unpacked. 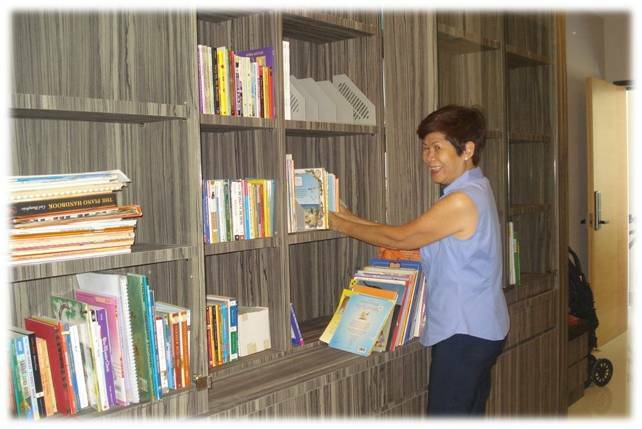 My SUPER-Mom putting books up on our new double-volume bookshelves! On the 12th, the kitchen countertop was finally installed and sanded down (yuck! ), and on the morning of the 14th, we flew to Brisbane Australia for a long-awaited holiday! More about that in the next post. We came home on the 21st, I did 7 loads of laundry in 30 hours, and have had contractors in and out of our home all week last week fixing this and installing that. It isn’t over yet though. Our stove doesn’t yet work, for one. But we cooked our first meal here last Wednesday after eating out for almost 6 weeks! *faint* And we are LOVING our new home. So that explains the LONG silence on this blog. More to come! Er … more blogging, not more silence. « Eczema and A DISCOUNT! So happy to see an entry… Finally. :) Love the bookshelf! Welcome back! Has always been curious how your books are organised… We are also book lovers ourselves and my husband just can’t stop buying books for the kids! Yes, and now we have storage problems!! !